The Green Party has urged an end to "one-party-state councils" as it launches its campaign for next month's English local elections.Co-leader Jonathan Bartley called for "a Green on every council", saying this could "change everything".He predicted the Greens would be celebrating "some massive wins" when the results are revealed.The party is looking to recover from last year's disappointing general election showing.Voters go to the polls across England on 3 May for local elections with seats on about 150 councils up for grabs. Local elections: Are they about bins or BrexitBut the leadership has urged supporters to look on the bright side, saying some Green policies are now "common currency".In a speech in south-east London, Mr Bartley - who shares the leadership with MP Caroline Lucas - said more representation for his party at local level will "build a better Britain from the bottom up". "We are taking the next step towards getting a Green at every table in every room - a Green on every council," he said, claiming he could "feel change coming right across the country". 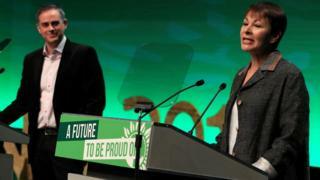 "There's not a seat in this country where the Greens cannot win," he told supporters.Voters are "tired of the status quo" of "cosy, complacent" councils dominated by just one party, he said, attacking councillors "sat down with a dozen of their mates, toeing the party line".The Green Party said it was contesting 2,200 seats this time, more than half of the total. These include defending seats in Norwich and Solihull, where it is the official opposition party.It is fielding its largest ever number of candidates in London.